Hello and welcome to this months RemARKably Created blog hop. This month our theme is Bundle Up as we are featuring some amazing bundles from the new 2018 Spring Occasions catalog. Currently, you are visiting my blog, Katrina's Kreative Heart, with me, Katrina Wolfe. Below, you will find the full line up with links to each of the blogs in the hop. Use these links to move from blog to blog so you won't miss any of the amazing projects and inspiration. 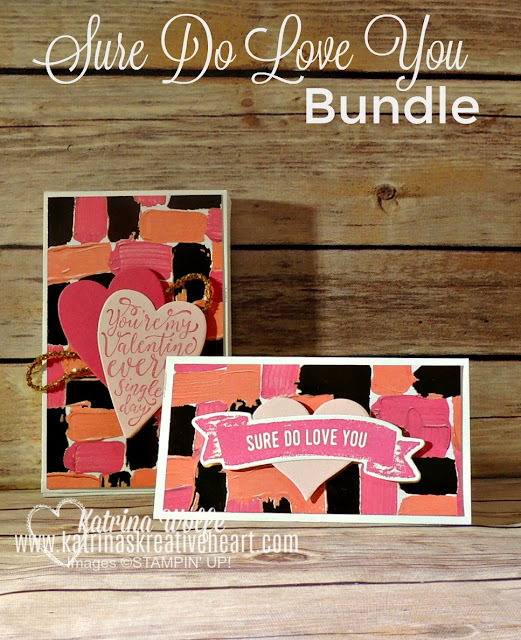 Today, I want to share with you one of my all time favorite bundles in the catalog, Sure Do Love You. I am just in love with this entire suite and this stamp and die set are just awesome. These boxes are so easy to make using the Lots to Love Box Framelits dies and can be used for so many things, such as a treat box filled with sweet treats (Sweet Tarts come to mind) but I really love them for holding the brand new Narrow Note Cards! To create this cute little box, I used a sheet of Whisper White cardstock and cut it in half. I ran each half through the Big Shot with the box die and put the box together. I have a video below to show you how. I then cut 2 pieces of designer series paper, from the Painted with Love collection, 4-5/8" x 2-3/4" and adhered one to each side of the box. I then cut out a Melon Mambo heart from the Lots to Love Box die set and stamped the sentiment on to a piece of Powder Pink cardstock and cut that out with the same heart die. I layered the 2 hearts together and added some of the gold Love Mini Tinsel Trim and adhered them all to the front of the box with Stampin' Dimensionals. For the note card, I started with a Whisper White Narrow Note Card and cut a piece of the Painted with Love Specialty Designer Series Paper 2-1/4" x 4-1/4". I then cut out a heart from Powder Pink cardstock using the Sweet and Sassy Framelits and added it to the center of the card with a Stampin' Dimensional. I then stamped the banner image with Melon Mambo ink onto a scrap piece of Whisper White cardstock and cut it out with the coordinating die from the Lots to Love Box Framelits dies. I added the banner over the center of the heart with Stampin' Dimensionals, and these adorable little Valentine's fit perfectly into the box and would make a great little gift to share with someone special. I hope you enjoyed today's project and are feeling inspired by all of the amazing projects in the blog hop. Remember, you are here at Katrina's Kreative Heart, with Katrina Wolfe and you will find the link to the next blog in the hop in the list below. If you would like to know about up coming events or to know what's happening in the world of Stampin' Up!, feel free to join my mailing list. I usually send out my newsletter twice a week to keep you informed along with tips and tutorials. If you would like a catalog and are not currently working with another demonstrator, I would love to get one out to you, just click here.